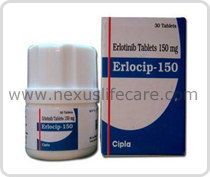 Uses:- Erlocip Tablet is consumed for curing non-small cell lung cancer. Erlocip Tablet is consumed in blend with gemcitabine for curing pancreatic cancer that has spread to nearby tissues or to other parts of the body. Side Effects:-Breathing, swelling of the tongue, lips, hives or face, increased coughing, chest pain, fever, severe or persistent nausea, loss of appetite, vomiting, eye pain or irritation, diarrhoea, dryness, skin rash, itching, weakness, acne, peeling, blistering, cracked skin, itching, burning of the skin, tenderness, growth of eyelashes on the inside of the eyelid and unusual bruising or bleeding.